→5 Best Electric Chainsaw 2019 – What is the Best Chainsaw? 5 Best Electric Chainsaw 2019 – What is the Best Chainsaw? Many people only think of gas-powered chainsaws when they want to buy a new chainsaw. Unfortunately, some people don’t even know that electric chainsaws exist. Electric chainsaws are the easiest, most appropriate and lightweight option for a lightweight home task. If you want to get the best electric chainsaws, then keep reading. Electric chainsaws have unique attributes and features that make it for anyone to use when compared with gas chainsaws. What makes the best electric chainsaw? The best electric chainsaw has several common features and qualities. One of the best features that make electric chainsaws the best option for most people is that its lightweight. Therefore, the best electric chainsaw has to be as light as possible, but it shouldn’t be too light that stability is compromised. A lightweight electric chainsaw is easier to control and use. Those with mobility issues on the hands and shoulders can use these best models. Electric chainsaws don’t use gasoline, therefore eliminating the hassles of mixing gas and oil or inhaling poisonous fumes produced. They are quiet when operating and its best suited to a neighborhood where houses are close together. The main features that you should consider when looking for an electric chainsaw include maintenance, safety, power, including accessories and support. 1. Performance – the best way to measure a chainsaw’s performance is by its cutting speed. The cutting speed is the measure of time takes by a chainsaw to cut through 10” square oak beam. 2. Ease of use – it should be easy to handle by anyone. A chainsaw that can easily start is preferred. It should also include the convenience of checking and adding lubricating oil. 4. Parts and maintenance – routine replacements, storage and cleaning of the chainsaw are crucial in keeping it operational. A chainsaw that offers chain replacement and adjustment option is preferred. 5. Cost – the cost of all the best alternatives in the market is crucial. Consider a chainsaw with essential features and a reasonable price. Electric chainsaws have several advantages and even though the advantages outweigh disadvantages, they have some cons. We should consider both sides of the coin. 1. Compact – it gives enough power for light to medium cutting tasks and duty trimming. 2. 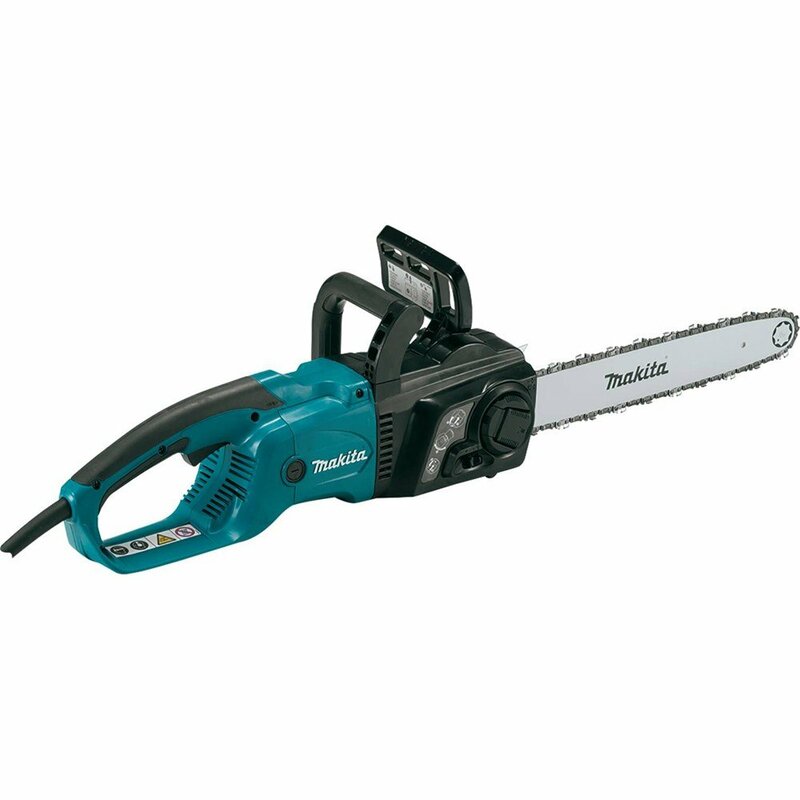 Quiet – electric chainsaws are quiet when compared to gas counterparts. 3. No maintenance required – no hassles of mixing oil and gas. No exhausts or fumes emitted by electric options. 4. Lightweight – they are easy to carry around as they are lightweight. They don’t have gas tank making them smaller, lighter and compact. 5. Affordable – they are relatively less expensive. 1. The extension cord – they come with cords that need to be managed all the time. However, with time you get used to it and it becomes easy. 2. Not suitable for heavy duty tasks – they are not designed for heavy duty tasks, but they perform most of the tasks at home. This WORX model has similar features as previous ones but has a shorter guide bar and relatively cheap. For those who are on a budget and with small cutting projects, this is probably the best electric chainsaw for your needs. It features an automatic oil lubrication system, auto-tension system, and chain brake. Its motor runs on 14.5 amps and with its shorter guide bar, it won’t handle wide pieces of wood. It still works great for felling small trees, cutting firewood, trimming and pruning. Therefore, this little saw isn’t weak because of a shorter bar. If you are tired of lugging around the heavy gas-powered saws or don’t have the strength to hold it for long periods, this lightweight chainsaw might be a better option. With its chain replacement and auto-free tensioning features, all the hassles seen in other chainsaws are eliminated. It doesn’t require one to be an expert to operate. The auto-tension have an oversized knob that secures the bar and the chain, therefore, maintaining proper tension when operating the chainsaw. This model consumes a considerable amount of oil, but it has the same low kickback bar and chain brake on the larger model and a 3-year warranty. Considering its price, you shouldn’t expect it to last for many years, so consider checking the warranty to understand how and when WORX will cover you. Black and Decker is a common name in power tool world and when it comes chainsaws, they concentrate on electric and battery-powered models. 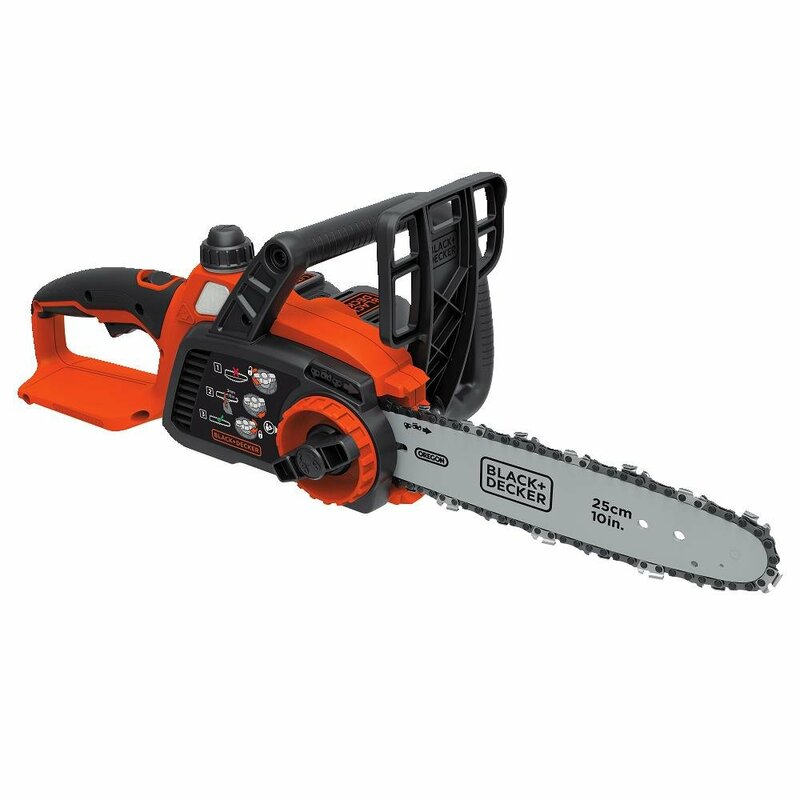 The LCS1020 is a rechargeable electric chainsaw that operates on a 20V battery. It is a lithium battery which leaves the machine charged five times longer than other competitive models. It’s one of the small size and lightest chainsaws. It’s ideal for pruning. Being a cordless chainsaw, it’s ideal for close quarter cutting especially when you need to cut in awkward and tight situations. It’s ideal for those who want a small and portable chainsaw for cutting firewood, trimming tasks and pruning. It is portable and makes it easy to maneuver and use in difficult angles. It has a great design with a handle after bale fashion and with a wraparound design. It has a 1o inch low kickback chain and bar and is ideal for different trimming and cutting tasks. It is equipped with a blade chain tensioning system. This system makes adjusting the chain tension quick and easy. It is lightweight and allows users it for a long time without getting tired. This WORX model is ideal for quick and easy jobs around the home and farm such as clearing brush, cutting firewood and trimming trees. It has an 18-inch bar and chain and can cut through medium and small-sized logs with ease. With its length, you should be able to cut through a 16” diameter log with a single pass. With an access to a power source, this model can be an alternative to smaller gas-powered chainsaws, especially when you don’t want the maintenance hassle involved in gas models. You might expect that with its larger blade and 18 inch blade, operating it could be challenging. However, that’s not the case. It has a balanced and lightweight design making the saw agile and easy to use. It has bucking spikes that offer stability when cutting and offer less vibration than gas models. All this makes the user get the work done without getting tired. The WORX WG304.1 has a unique design and comes fully assembled, which means that you will be up and running quickly. If you have been using expensive gas models, you might find its plastic construction a little flimsy. Obviously, there is a trade-off between construction quality and cost and this saw is relatively inexpensive. However, with its plastic construction, this saw is lightweight and involves little attention and care. It has a 15 amps motor and it’s one of the powerful electric motors. Unlike gas models, I find this electric saw quiet when operating. You won’t feel guilty about ruining the neighbor’s weekend. It comes with an oversized knob for securing the chain and bar together and automatic lubrication when under operation. This offer constant lubrication to the chain and bar. Its oil reservoir is 200 ml. and has a transparent window to assist in checking the levels. The Makita UC4051A offer a lot of great features. It comes with a 16-inch long guide bar and its chain rotates at the speed of 2,900 FPM. This allows you to cut a wide piece of wood quickly. It cuts quickly for an electric saw as we know that it doesn’t cut fast as gas-powered machines. The Makita starts and operates smoothly and its automatic chain oiler ensures that you don’t worry about manual lubrication of the chain. That’s what I love about this machine – I can just plug them in and start using. This model also features a tool-less chain tensioning systems. Anytime you need to tighten the chain or make other adjustments, you won’t need to carry other tools to do so. I find it quite easy to adjust, but the plastic is somehow flimsy and you should be careful when handling. One feature that I find to be useful is its current limiter, which provides overload protection to the motor from excess current. It will reduce power flowing through it and help in avoiding a burnout. Many homeowners cut corners by using an extension cord, whether for the chainsaw or not, which can put you at risk for malfunction. The current limiter should have covered you, though, if you do so. 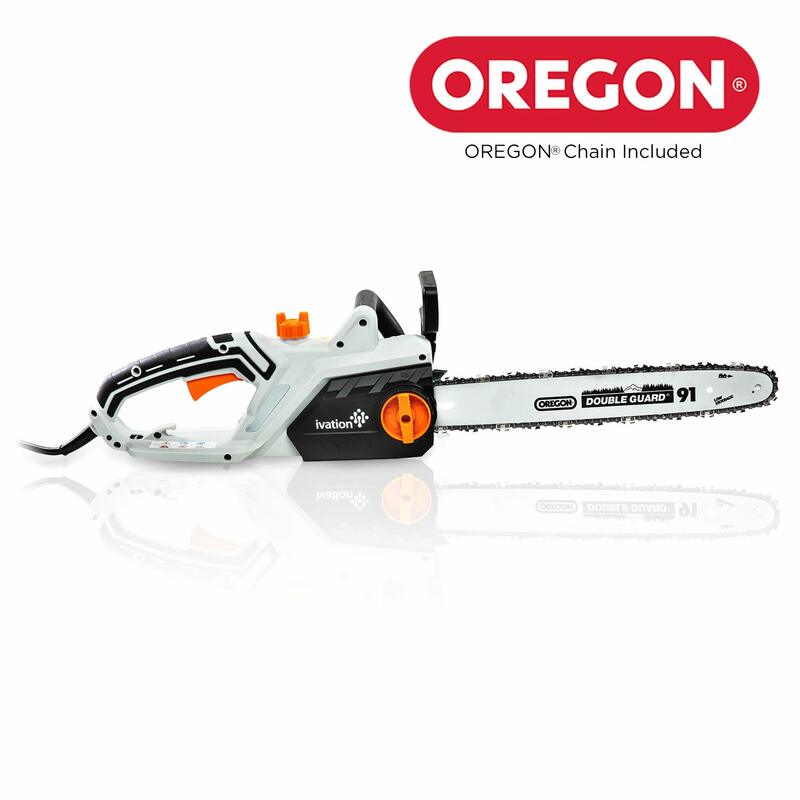 Its overall cutting power and performance are impressive for an electric chainsaw. Although the design of the oil system seems to be flawed on some models, some have reported leaking. Thanks to its 30-day trial period, however, it should not be a problem to replace it should you run into the problem early on. This might be an excellent choice for beginners as it comes with a tool-less system, ample amount of power and a built-in limiter. When it comes to the bar size and power, this electric chainsaw is at the top of the range. It can handle a wide range of medium and light cutting duties around the yard and home. With its 16 inch bar, it can cut through wide logs with a single pass. It is easy to handle and has a good weight to power ratio. It is extremely quiet when operating. This makes it possible to do your job without upsetting your neighbors. Keeping a chain properly tensioned when operating a chainsaw is critical for better performance and to ensure that it doesn’t slip from the bar. Chain tension is easy to maintain due to its tool-less chain tensioning knob. You will require a screwdriver for other models to carry out the task, but for this one, you won’t need one. This model might not be the most powerful, but it gets the work done. This is a corded model that comes with a 15.0 amp electric motor. It’s also well-constructed and most users find it sturdy. It has a traditional but stylish design with easily accessible oil cap, half wrap front handle and comfortable rubber gear grip. With its automatic oiling system, this electric chainsaw requires little maintenance. Its Oregon chain should be good for light jobs. It comes with an oil reservoir with a level indicator. There are many electric chainsaws to pick from and most of them are good. The truth is, there is not electric chainsaw that is powerful enough to cut large trees. In the top electric chainsaws above, it’s mandatory to look for chain bar length, whether auto-oiler or manual, and whether corded or battery powered. Battery powered chainsaws might be great for mobility, but they offer small power. The battery also adds on the overall weight making them hard to use. For areas that are difficult to reach, you will need you will need a longer chain bar. For smaller tasks, get something smaller as it gets lighter and safer to use. Auto-oilers makes chainsaws convenient when it comes to maintenance, but it can lead to issues like oil leaks. Models with manual oil application are less prone to leaking. The 8 Best Circular Saw in 2019 – How to Pick Right! Best Tool Sets 2019– Are Corrosion Resistant Tools The Best? Diyhouze.com is a participant in the Amazon Services LLC Associates Program, an affiliate advertising program designed to provide a means for sites to earn advertising fees by advertising and linking to Amazon.com. Additionally, Diyhouze.com participates in various other affiliate programs, and we sometimes get a commission through purchases made through our links. Copyright text 2017 by DIY Blog - Woodworking, Plan.